(next entry) CAMJam 2019 is Here! 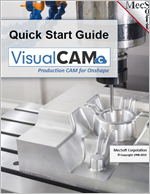 Blog / New VisualCAMc User Guides Available! Get a quick start to learning VisualCAMc by completing this 85-page tutorial. You will learn the basics of VisualCAMc by creating cutting toolpaths and CNC g-code to machine a basic part. Here is a list of what you will learn from the new VisualCAMc Quick Start Guide. Load the VisualCAMc app into Onshape. Get an understanding of the VisualCAMc user interface and create cutting tools. Create a 2 Axis Facing toolpath including tool selection, control geometry selection, set feeds and speeds, clearance plane definition. Cutting parameters, cut level parameters, entry/exit parameters and advanced cutting parameters. Create a 2 Axis Profiling and Hole Machining toolpaths. Simulate your toolpath operations and view in-process stock. Generate and download G-code to cut the part on your CNC machine. 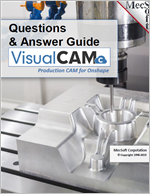 The new 125-page VisualCAMc Question & Answer Guide contains concise information so that you learn quickly. Each question is answered with the menu selections required to complete the task and illustrations to help you understand the results. A complete Getting Started section answers all of the basic questions new users will have. How to select geometry regions for machining. Creating cutting tools and tool related questions such as how to load and export a tool library. How to setup a part including defining stock dimensions and work zero locations. How to generate and simulate a toolpath and how to access all of the cut related parameters. How to edit toolpaths associatively and using Onshape part configurations. How to setup a multi-sided part for flip-machining and indexed 4 and 5 axis machining. How to analyse and measure part geometry from within VisualCAMc. 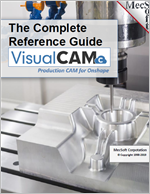 The new VisualCAMc Reference Guide contains information on every VisualCAMc command and parameter. This 500-page guide is packed full of the useful and critical information you need to get your CNC cutting toolpaths generated, simulated and G-coded fast. This guide includes detailed instructions on using the new VisualCAMc Analyze toolbar as well as all of the other VisualCAMc toolbars, dialogs and parameters. These user guides are free to download and do not require you to be logged into your Onshape account. Just select from the links below to download.